They bracketed an era. Maggie, first elected as an FDR New Deal Democrat, who created the modern American fishery, and Ted, the Alaska Republican who carved the empire into winners and losers, shaping the fishing industry of the US for the next century. We spent quite a bit of time this winter thinking about the Magnuson-Stevens Act, which is turning 40 this week. It is easy to be critical of the act, plenty of people are. We have just finished our second book, arguing about what it got wrong. But the fact of the matter is, given the political context in which the act was signed, it did a pretty good job. The Fisheries Conservation and Management Act (now known as the Magnuson Stevens Act, or MSA, after the two senators who did most to shape it, Warren Magnuson and Ted Stevens) passed 40 years ago last week, in 1976. Our friends know how bad we are about remembering birthdays, and did not remember this one either, we depended on the Pew Charitable Trust to mark the date for us. (Check out their list of five things we now know about the ocean, that we didn’t know in 1976). Many of our posts on the blog deal with the events that led up to passage of the MSA–mainly the foreign boats (especially Soviet boats) fishing off American waters, as Bob Hitz had told us about. The Departments of State and Defense were opposed to widening the territorial sea from three to 200 miles, but Congress acted after people overwhelmingly supported controls on the foreign boats–especially Soviet boats–in American waters. The seas were an important battle front during the Cold War, and the competing pressures made it difficult to reach agreement on expanding the territorial sea from three to 200 miles in 1966. What was to be done about fishing? 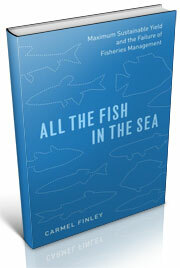 There were eleven agencies involved in fishing in some way, with little incentive for them to cooperate—there were not even mechanisms if they had wanted to cooperate, according to Edward Wenk Jr., a policy staffer during the Kennedy and Johnson administrations, who wrote about the messy policy debate in The Politics of the Ocean, published in 1972. [i] For anyone interested in this period, Wenk’s book is essential reading. Also essential is From Abundance to Scarcity, by Michael Weber. 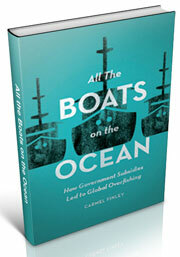 The history of American maritime policy is found within a complex stew of competing agencies. The Coast Guard was created in 1790, the Navy in 1798. Federal intervention into the fisheries was piecemeal and spasmodic, responding to crises and with no overall attempt at an integrated policy. Federal fishery scientists in the postwar saw their role as supporting the economic role of fishing, finding markets so that American fishermen could sell more fish and make more money. 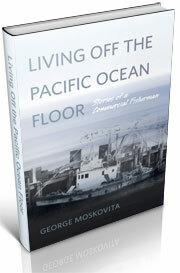 But for the post-war American fishermen, especially in New England but also in California, the problem was not finding new markets; the problem was the American industry could not complete with cheap tuna from Japan and cheap cod from Canada and Iceland; fisheries in all three countries were subsidized by the state and American fishermen had almost no access to government aid. The thrust of American post-war economic policy was free trade. As the Cold War deepened, it was essential to rebuild the Japanese and German economies, and re-integrate both countries into global trade. Also important was to tilt countries such as Iceland and Norway towards the US, and not to trade with the Soviets. Thus the State Department worked to increase cod imports from Iceland and Norway, and canned tuna from Japan. The post-war American fishing industry spent most of the 1950s fighting with the federal government for a tariff to protect their markets. Despite many hearings, they failed dismally. Americans were buying a lot more fish but unfortunately it wasn’t fish caught by American fishermen. The Saltonstall-Kennedy Act in 1954 collected 30 percent of gross receipts of custom duties on imported fish products and directed them to doing marketing and research for the industry. After the passage of the Fish and Wildlife Act in 1965, the bulk of money was soon devoted to general operations of the Bureau of Commercial Fisheries (BCF). [i] The new Bureau “was not much more important than the Fish and Wildlife Service had been,” said Wenk. [ii] Recreational fishermen and the processing industry sought to blunt the power of the commercial industry. “The United States should be the leading fishing nation of the world because it has all the qualifications for this position,” the new bureau stoutly argued in 1968. [v] Despite extensive coastlines, stocked with many different kinds of fish, Americans were importing more and more of the fish they ate, and the American fishing fleet, which should be the best in the world, clearly wasn’t. While most other countries created direct loans to fishermen to build boats during the 1950s and 1960s, the Americans would not do so until 1970. Led by Warren Magnuson, the first federal fisheries planning was done after the passage of the 1976 act. Magnuson had complained for more than a decade that the most important battlefront in the Cold War was being fought on the nation’s fishing grounds. And with the passage of the bill that bears his name, he set about modernizing and industrializing the American fishing industry. [i] Michael Weber, From Abundance to Scarcity: A History of U.S. Marine Fisheries Policy (Washington, D.C.: Island Press, 2002), 21. [i] Edward Wenk Jr., The Politics of the Ocean (Seattle: University of Washington Press, 1972), 47. [i] David Helvarg, Blue Frontier: Saving America’s Living Seas (New York: W. H. Freeman and Company, 2001), 177. [ii] James P. Walsh, “The Origins and Early Implementation of the Magnuson-Stevens Fishery Conservation and Management Act of 1976,” Bevan Lecture Series on Sustainable Fisheries, School of Aquatic and Fishery Sciences/School of Marine and Environmental Affairs, University of Washington April 24-25, 2014. This entry was posted in Cold War, Fisheries policy, Fishing, History of Science, Maximum Sustained Yield (MSY), Pacific Fishing History Project, Soviet environmental history, Soviet fishing, Soviet history' and tagged Ted Stevens, warren magnuson. Bookmark the permalink.